Ohio led 17-3 at halftime, before Quentin Poling intercepted Bahl and returned it 25 yards to the end zone on the first snap of the second half. Poling, the reigning collegesportsmadness.com MAC Defensive Player of the Week, says the defense didn’t play perfectly, but it came pretty close. The RedHawks only entered Ohio territory three times. Poling’s complaints are possibly a restatement of something he’s been told by the coaching staff. According to the linebacking corps, defensive coordinator Jimmy Burrow holds them to a very high standard. “Coach Burrow’s goal is for us to win 2-0,” Jovon Johnson added. Johnson had one of the four interceptions in his first game back from injury. Derrius Vick completed 21 of his 33 pass attempts for 243 yards, a touchdown and an interception. Vick’s top target, Sebastian Smith, reeled in nine receptions for 91 yards, including a 6-yard score. The Bobcats outgained the RedHawks 428-253 and Ohio limited Miami to just 87 rushing yards. Bahl finished 8 of 23 for 150 yards and was picked off four times. Jared Murphy caught three passes for 76 yards. Maurice Thomas led the Miami ground attack with three carries for 44 yards, 43 of those coming on one play. The RedHawks’ only points of the afternoon came on a 34-yard field goal by Kaleb Patterson in the second quarter. Ohio handed the ball off to five different running backs in the win. Daz’ Patterson gained 35 yards on 11 rushes and had a 2-yard touchdown in the first quarter. Maleek Irons led Ohio on the ground with 49 rushing yards on 11 carries and a 1-yard touchdown. 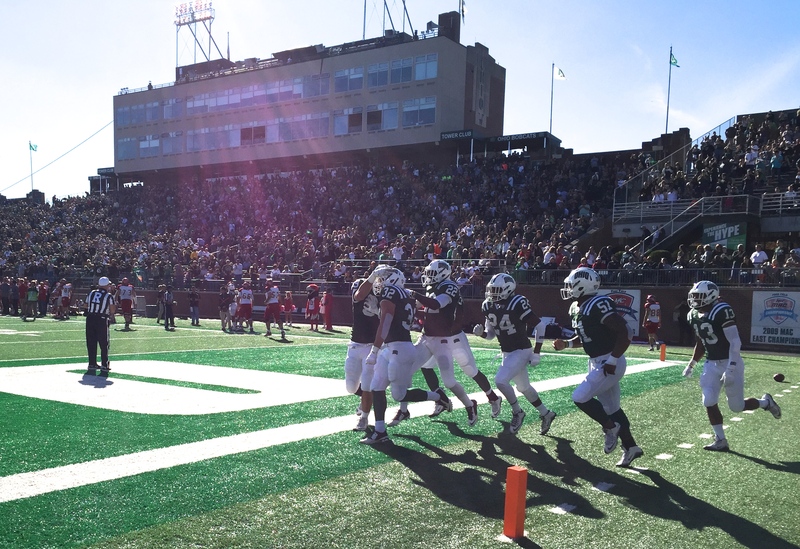 The official attendance of 25,086 ranks as the fifth-largest crowd in Peden Stadium history. The 31-point margin of victory is the most by which Ohio has defeated Miami in the history of the series. The Bobcats will look to stay undefeated in MAC play when they host Western Michigan (2-3, 1-0 MAC) next Saturday.